Acupuncture and Chinese herbs, Injection Therapy are very effective for reducing inflammation, regulating hormones, improving circulation, and regulating nerve signals to and from the brain. Cosmetic acupuncture helps to erase fine lines, reduce deep lines, improve jaw line and neck tone, reduce swelling, and improve the youthful look of your face and neck. For Adults: pain, numbness, carpel tunnel, sciatica, frozen shoulder, injuries, circulation, chest pain, stomach pain, neck pain, low back pain, knee problems, arthritis, fatigue, stress, anxiety, digestive issues, weight loss, detox, reflux, Chron’s disease, hemorrhoids, irritable bowel, chronic constipation, chronic diarrhea, headaches, PTSD, depression, frequent cold and flu, fatigue, fibromyalgia, Bell’s Palsy, trigeminal neuralgia, insomnia, eczema, autoimmune disorders, stop smoking support, relief from chemo-therapy side effects, chronic cough, asthma, allergies, sinusitis, post stroke symptoms, and general health and wellness. For Kids: reflux, colic, chronic diarrhea, chronic constipation, stomach pain, asthma, allergies, eczema, ear infections, irritability, anxiety, fatigue, ADD/ADHD, headaches, muscle pain, stress, injuries, depression, developmental delays, bed wetting, cold and flu, cough, sinusitis, and general health and wellness. For Women: infertility, frequent miscarriage, PCOS, PMS, menstrual cycle problems, breast issues, perimenopause symptoms, menopause symptoms, endometriosis, menstrual pain, post partum depression, healing from birth trauma, pregnancy health for mother and baby, labor stimulation, and help turning the baby. 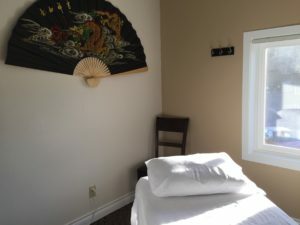 Reiki/Medical Qi-gong works very well combined with acupuncture- it can improve the results of a treatment and help with overall emotional and spiritual wellness. Reiki by itself is good for conditions that are emotional or spiritual, and helps to balance the chakra system. It works especially well for emotional trauma, depression, and PTSD. Cupping combined with acupuncture is really good for muscle tension, bringing circulation to an injury, and pulling lactic acid out of damaged tissue. Acupoint Injection Therapy is an excellent therapy for weight loss, detox, improving immunity, and reducing pain in arthritis and other pain conditions.